On May 2011, Boyfriend first came up as lovely cute boys with their debut single "Boyfriend”. Boyfriend (Korean: 보이프렌드) is a six-member South Korean boy group under Starship Entertainment consisting of Kim DongHyun, Shim Hyunseong, Lee JeongMin, Cho Youngmin, Cho KwangMin, and Noh MinWoo. They are the first boy band to have twin members. Their official fanclub name is "Best Friend". Boyfriend has won multiple awards such as Best New Artist in the SBS MTV Best of the Best, Best Newcomer Award in the 21st Seoul Music Awards and Best 3 New Artists (Asia) in the 27th Japan Gold Disc Awards. Now, all 6 members have become so manly and powerful like home fatale with their recent comeback, “Witch”. The track placed 1st on SBS MTV's 'The Show Season 4’. Boyfriend maximized expectation of their first mini concert in Malaysia by going through lots of concerts successfully over the world such as Japan, Taiwan, China, Thailand, the United States, Puerto Rico, and other countries as well. 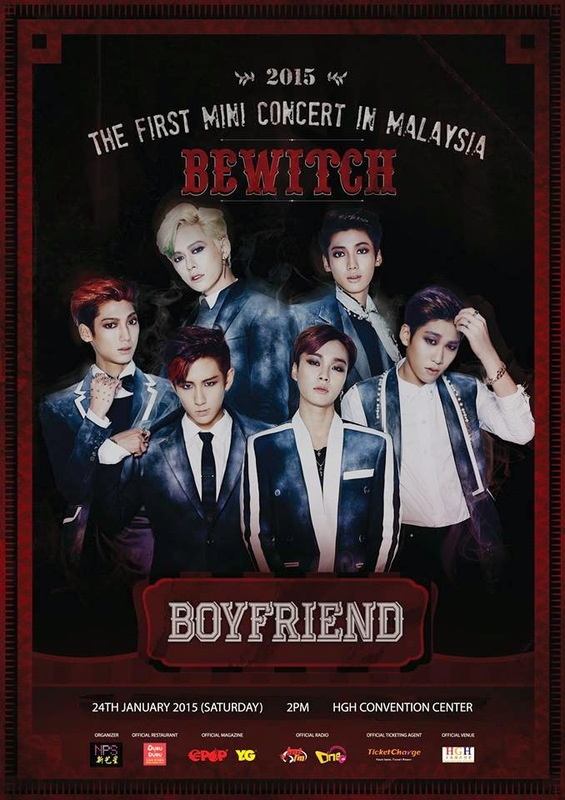 After four years, they are finally able to meet their fans in Malaysia for Boyfriend the First Mini Concert in Malaysia “Bewitch” 2015, upon fans’ love call. 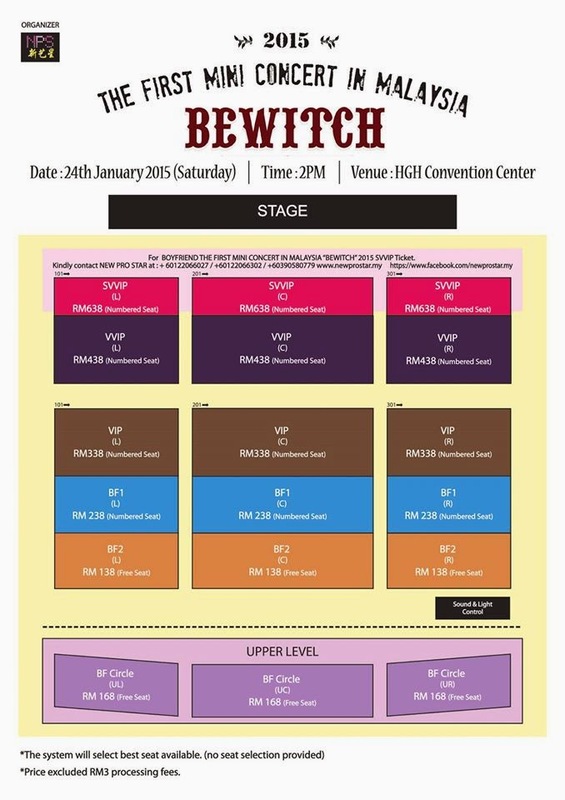 Boyfriend the First Mini Concert in Malaysia “Bewitch” 2015 is proudly present by New Pro Star. We bring hallyu wave to the shore of Malaysia since 2012 with a star-studded line up of the idols from South Korea such as Running Man Sparta Kim Jong Kook, MIK, AlphaBAT, The Boss (DGNA) and EvoL. This mini concert will attract so many fans with variety aspects of their charm like from cute boys to wild wolves. It will be held at HGH Convention Centre. The first outstanding stage for fans who have always been along for 4 years. On January 24th, 2015, it will be unveiled. merchandise and also limited edition poster. Check out New Pro Star Facebook or contact us through our hotline for more details. VVIP, VIP, BF1, BF Circle & BF2 tickets will be on sale on 20th December 2014 via Ticket Charge website <www.ticketcharge.com.my> . 1st 1000 ticket purchase on the first day of ticket launce will enjoy 10% discounts on all tickets except SVVIP. * Price of the tickets of all categories are subject to RM3 processing fee.